Got a warm friendly welcome! And a happy birthday bouquets 💐The apartment is great for our entire family. We had a wonderful time here, thank you! I would highly recommended this place to friends and family. Arigato!! Convenient location, short (10 minute) walk from JR Kanda station (Yamanote line), very clean, modern unit. Elevator access. Easy check-in (directions and access code were provided in advance). Elevator access to 4th floor unit. Japanese modern style. They provide enough detergent for washing utensils & clothes. Supply big shampoo,conditioner & bodywash. Near Family mart and Halal Aladdin restaurant. About 8 minutes to train. Free pocket wifi. 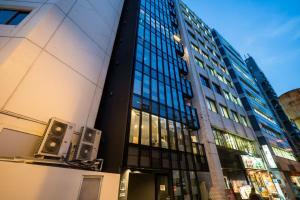 Perfect location - just tucked away from the busy areas, but a short walk to Tokyo and Akihabara stations. Everything you'd need is near the apartment like Family Mart or Seven Eleven, Akihabara Station and of course Akihabara electric town. Also Ueno Zoo is about 30 minutes walk from the apartment but one can discover so much while walking in Chiyoda-ku. More importantly, many thanks to our host Katsuaki Ito and the Omotenashi Crew at Akihabara Luxury Cityhouse, they have been great hosts to us until the end and you helped us so many times in our first time stay in Japan. Very conveniently located. Check in was really easy. Communication was good. Clean. Comfort.lovely place. Do you have at maybe another place like near sibuya or shinjuku. Next time we will stay again at your place. 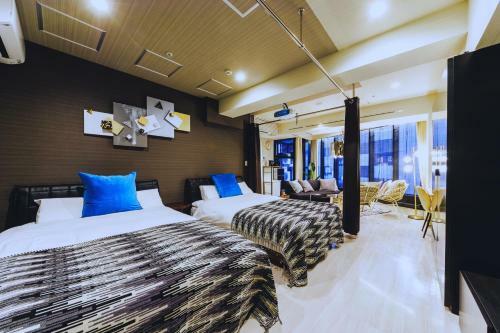 Lock in a great price for Akihabara Luxury Cityhouse – rated 8.5 by recent guests! 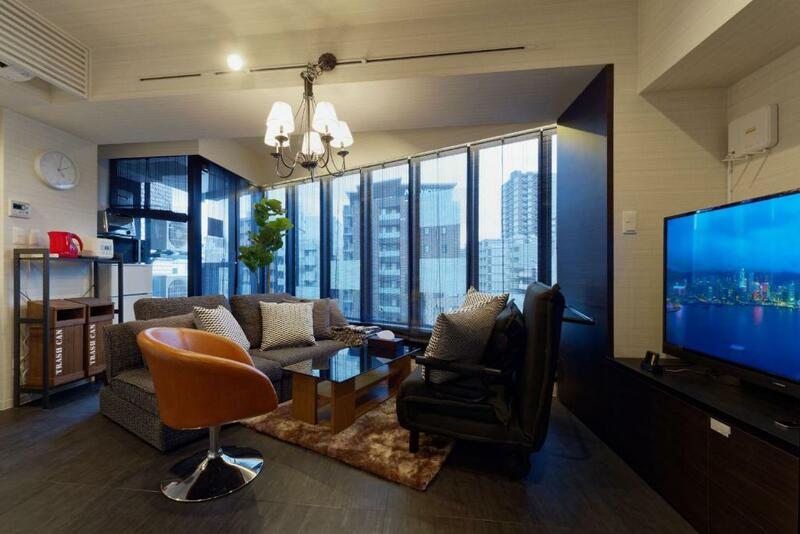 Akihabara Luxury Cityhouse This rating is a reflection of how the property compares to the industry standard when it comes to price, facilities and services available. It's based on a self-evaluation by the property. Use this rating to help choose your stay! 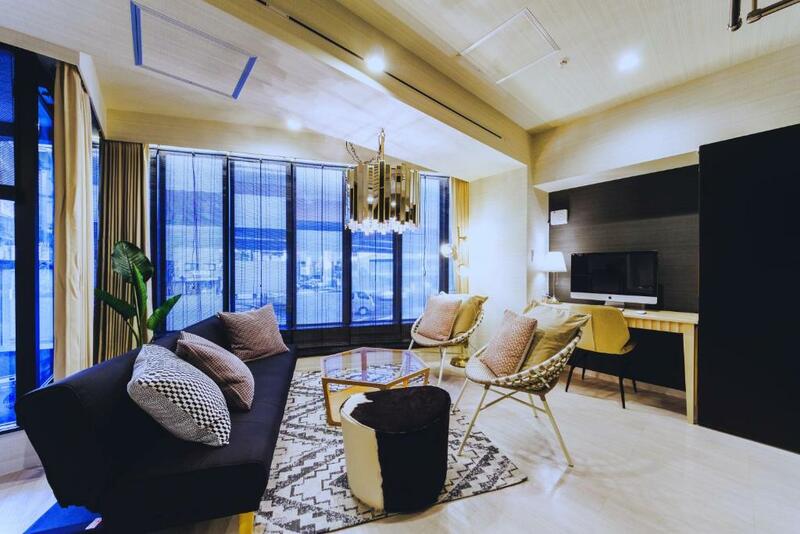 One of our top picks in Tokyo.Conveniently located just a 5-minute walk away from both Kanda Station and Shin-Nihombashi Station, Akihabara Luxury Cityhouse is an apartment that features a balcony and free portable WiFi routers for guests during their stay. Free WiFi is also featured throughout the property. All units at the apartment feature a 50-inch flat-screen TV, Apple TV, Netflix and a PlayStation 3 game console. Guests can use the fully-equipped kitchen which comes with a microwave, fridge, stove and an electric kettle. The private bathroom has a bath and shower, while towels and toothbrushes are provided for free. Edo Tokyo Museum is 1.2 mi from Akihabara Luxury Cityhouse, while Japan Imperial Palace is 1.4 mi from the property. Guests can take Chuo Line, Keihintohoku Line or Yamanote Line to reach Tokyo Station in 8 minutes. Akihabara Station is also an 8-minute train ride away. The nearest airport is Tokyo Haneda International Airport, a 35-minute train ride from the accommodations. Narita Airport is approximately a 60-minute train ride away. Chiyoda is a great choice for travelers interested in culture, cleanliness and city walks. When would you like to stay at Akihabara Luxury Cityhouse? This apartment features modern Japanese-themed decor. Rooms come with a free portable WiFi router, 50-inch flat-screen TV, an Apple TV, Netflix and a PlayStation 3. This one-bedroom apartment features modern Japanese-themed decor. Rooms come with a free portable WiFi router, 50-inch flat-screen TV, an Apple TV, Netflix and a PlayStation 3. This apartment features a electric kettle, toaster and tile/marble floor. Rooms come with a free portable WiFi router, 50-inch flat-screen TV, an Apple TV, Netflix and a PlayStation 3. This apartment has a sofa, air conditioning and stovetop. Rooms come with a free portable WiFi router, 50-inch flat-screen TV, an Apple TV, Netflix and a PlayStation 3. This apartment features a sofa, tile/marble floor and balcony. Rooms come with a free portable WiFi router, 50-inch flat-screen TV, an Apple TV, Netflix and a PlayStation 3. This apartment has a sofa, toaster and kitchenware. Rooms come with a free portable WiFi router, 50-inch flat-screen TV, an Apple TV, Netflix and a PlayStation 3. Rooms come with a free portable WiFi router, 100-inch home theater system,50-inch flat-screen TV, an Apple TV, Netflix and a PlayStation 3. Rooms come with a free portable WiFi router, 100-inch home theater system, 50-inch flat-screen TV, an Apple TV, Netflix and a PlayStation 3. 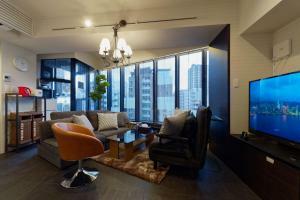 [AKIHABARA Luxury house] This is designer-brand apartment. Each floor from the 2rd to the 10th has a various concepts. 100inch projector screen and iMac ■imac & ColorPrinter ■100 inch projector screen ■Unlimited movie streaming with Netflix ■AppleTV ■Smoking area on each floor ■Complete private space 1 room on each floor ■Latest style toilet, bathroom ■Washing machine, indoor drying, dryer available ■Mobile charge cable, various chargers available Plenty of Shiseido amenities! We’ve got everything ready for your long stay! Perfect place for long-term business trip or temporary visit. ===Number of people=== The "COMFORT LEVEL" you would feel during the stay changes depends on the number of people who are staying. 1- 2 people Very luxury space. 3 - 4 people Comfortable space. 5 to 6 people Bit small yet can spend fabulous time with your company! -Number combination lock -Complete private area, one room on one floor -Also the elevator requires the password, it ensures the security. -Monitorning camera is on 24hours checking the entrance. Area Info – This neighborhood is a great choice for travelers interested in culture, cleanliness and city walks – Check location Great location - show map Guests loved walking around the neighborhood! 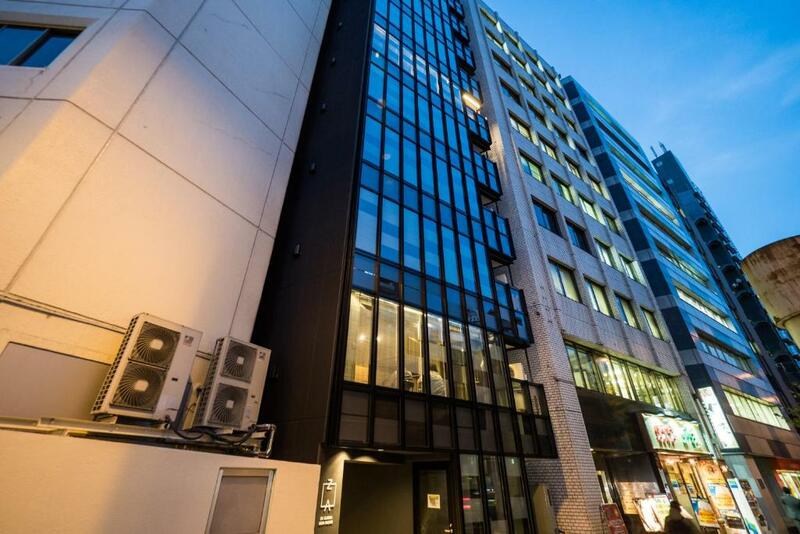 House Rules Akihabara Luxury Cityhouse takes special requests – add in the next step! One child under 6 years is charged JPY 1080 per night when using existing beds. Akihabara Luxury Cityhouse accepts these cards and reserves the right to temporarily hold an amount prior to arrival. Please inform Akihabara Luxury Cityhouse of your expected arrival time in advance. You can use the Special Requests box when booking, or contact the property directly using the contact details in your confirmation. The location next to an overpass made it quite noisy but ear plugs were supplied. It was conveniently located near kanda tube but next to a noisy overpass. We shared a room for 5 which was quite a squeeze but fun for only 3 nights! Any longer and it may have felt a bit claustrophobic. Access to better cleaning equipment as our stay was 9 days. The vacuum provided didn’t really pick up much. I did informed a staff member who was very helpful and check & cleaned it. But I still struggled with it due to lack of suction. A mop and bucket would have been handy to have also. Super comfy beds, access to a large T.V ,apple T.V access to charging cords and cord adapters. Loved the self contained kitchen with everything provided. Walking distance to family mart and seven eleven which are a blessing!! So cheap and provided so many delicious meals if you are on a budget. Short walk to Kanda Station. Great bathroom facilities and access to washing machine. We felt very safe and comfortable during our stay. Thank you! Space was a bit tight, but not surprising for Tokyo. Instructions for the elevator code were a bit confusing. Everything, generally was good and we had a really good stay. Washing machine and dryer were really useful. Good convenient location for the rest of Tokyo. No staff at the counter at all time. Need to call hot line to check. The apartment is very clean and comfortable. The facilities are well set up with very convenience wifi/usb cable/kitchen ware etc. I’ll definitely come back when I visit Japan again. Space was normal for a central Tokyo unit - sufficient for a family of 5, but not very spacious. The space is rather small and quite cramp for 6 people. More suitable for 4 pax. I was expecting a bigger area. Other than that is ok.
Got confuse when using the elevator going upstairs using the buttons. walking distance to Kanda Station. Halal restaurant just 2 minutes walk. Highly recommended! The check-in experience. The person was unhelpful and cost us about 9,000 yen. He provided discount vouchers for ski hire in a pouch with other documents, but did not tell us about the discount vouchers. We payed full price for the ski hire. We only found out about the vouchers when it was too late. The apartment was very cute, clean and cozy! everything in Japan is small so space is limited and this place was great enough to sleep the 4 of us and we managed to have enough space for all out luggage. The location was a short walk to Kanda station which was very convenient. We left behind a jacket and a small pillow and the host contacted us immediately and coordinated a pickup date which was very nice and appreciated! great place to stay! highly recommend it! The apartment was right next to a busy highway, traffic noise could be heard though we were able to sleep through it. The apartment was equipped with all the facilities we needed with our stay over 6 days. The bathroom was presented quite classy, a well-equipped kitchen (with rice cooker & toaster). Location was superb. The TV was connected to Netflix and Playstation which provided entertainment in the night (made us feel at home). Thank you.